Sunday Long Run Brunch – This Sunday! For all of you that participated in the Sunday Long Runs this winter, it’s time to celebrate! For all of those that finished a grueling Boston, or ran your first half, or any half, and to those with marathons and halfs coming up over the next few weeks, you’ve earned yourself one BIG breakfast!!! This year we’ll be holding the brunch at Nancy’s house on Sunday April 29th at about 10AM. This is a pot luck brunch. Bring a bit of food and we’ll meet after our informal long run on Sunday and raise a toast to all you runners. The address is 14 Linden Place in Melrose. Its off of Green St, but if you park over in the Johnnies parking lot its right across the street. As far as the run goes, what are people up for? I was thinking we could start a little early and do Horn Pond? That’s 14 miles, people can tack on summer route miles to extend. I’ll do some impromptu water stops if I’m not running. Sound good? I’ll link a map HERE later. Post here if you’re running, if your coming to brunch, and what you’re bringing to brunch. Also, spread the word. I’ll try to e-mail people, but if you know some people (like Mystics) let them know to stop by. There have been a few questions on the plans for this weekend. Since the training plan is over, this is sort a free period to bridge to other marathons on the list for people. We have a few doing Providence in a few weeks, many doing Sugarloaf as a do-over for Boston, and a couple with plans in late May to run Vermont City. I’ll post here for people to plan. Pick a route from the past and we’ll work around it. Water stops will be less coordinated, I’ll bring the buckets and people can throw in some gatorade and water through the weeks. I won’t be collecting money but I’ll pitch in to get the supplies where they need to be when I can. So where do we want to go this week? Also I’d like to have the Sunday Long Run Brunch next week or the week after. Any volunteer to host? Let me know if you’re interested and which week is better for you. This week begins the unofficial Sunday Long Runs. Unfortunately I can’t make it this Sunday… gymnastics meet to attend. I know some of you are running Saturday, many are running in a little race on Monday. If there is interest in Sunday, and if there is someone willing to coordinate water stops, there will be a Sunday Long Run, otherwise you’re on your own this weekend and we’ll reconvene next week. Also its time to start planning for the annual Sunday Long Run Brunch. I’d like to hold it about 2 weeks from now. If anyone would like to host let me know and we can start the planning. Good luck to all that are running Boston this year!!! I know the weather isn’t what you would have ordered but months of training will get you through the 26.2. Maybe not in the time you were thinking but go out there and show Mother Nature what you’ve got. Good luck and enjoy the experience. It doesn’t get better than Boston! 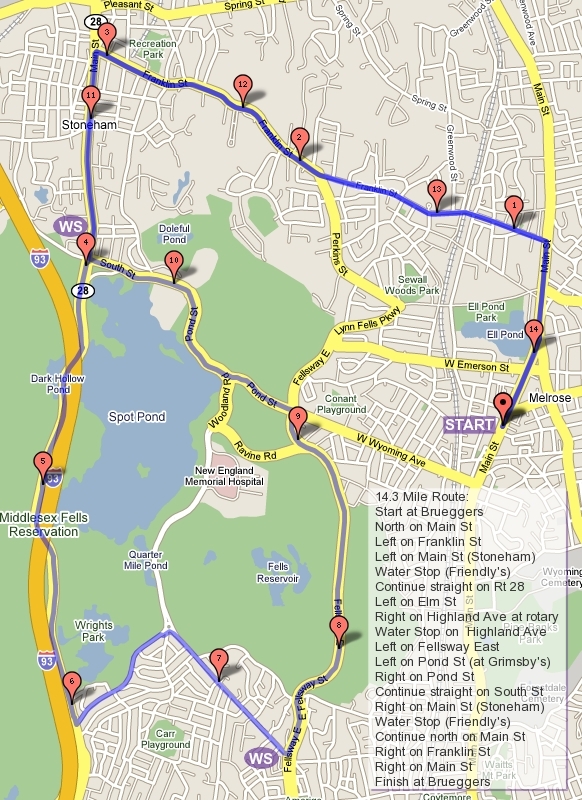 For those running Boston, this is it… your last long run before Boston. Going out the way we came in, we’ll be running our Sunday Run on Saturday. Remember when we were out on the streets on Saturday December 31st right before the New Year rolled in, preparing for a race long out in the future. Now Easter eggs are rolling in this Sunday so Saturday at 8AM we’ll be taking to the streets. This week we have 12.5 on the docket. This run was a tough 12.5 back in January, hilly and considered long back then. Now this is your easy taper run. Take those hills easy, enjoy the weather, and don’t do anything stupid. This week just get in the miles, keep a decent pace, but don’t push it!!! Save that for a week from Monday. For water stops, we have one major one on Highland Ave. I’ll probably be taking care of that. If anyone wants to volunteer they can do one at Straw Point. Who’s in for the Saturday Long Run? ROLL CALL!